During the spring break in Plein-Sud, every afternoon, you can meet budding artists who are determined to learn the secrets of the stage. Thanks to the professionals in charge of music-hall entertainment, they are delighted and enthusiastic about all aspects of a great show. Every day around 2pm it’s the deal in the theatre! A real small group of budding actors is at work. 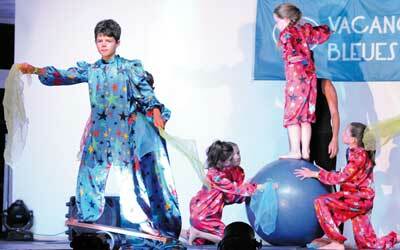 When some children are busy creating sets and costumes, others rehearse different paintings on stage. With gentleness and pedagogy, a facilitator shows the younger ones how to hold a microphone and how to sing in playback. Further on, a small group, very attentive to the director’s technical explanations, works on the staging and lighting. 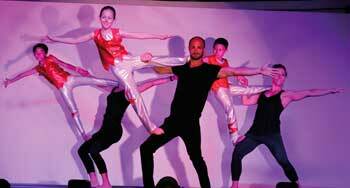 At the back of the room, on gym mats and under the guidance of a professional, a group of teenagers imagine the choreographies. Despite the concentration and seriousness that can be seen on all faces, there is a sense of euphoria. Indeed, from each small workshop, there is a good mood, bursts of voices and bursts of laughter. However, Broadway only has to behave properly because for novice artists, there is no question of disappointing! Everyone is indeed very attentive to the indications of professionals but also participates in improving the performance of others. It is a real exchange that is organised between the children and the show experts, but above all between the children themselves. It’s the big night! The light goes out, in the room the silence is made... From the control room, Romain, 12 years old, presses the button that turns on the main projector. A little girl comes forward feverishly… it’s the beginning of the journey! Capucine, 7, is on vacation with her grandparents, but when it’s night and time to fall asleep… a magical story can begin. It is then a grandiose show, perfectly rhythmic and worthy of the greatest musicals that children make under the amazed eyes of their ancestors. Parents and grandparents remain glued to their seats while tableaux vivants, songs and dances of an almost professional level follow one another! Rocked by the greatest songs in the music-hall repertoire, they almost forget that it is their children who play and then let themselves be taken on the magical journey! When the light finally comes back on the audience, a thunderous applause welcomes the end of the show. It is with joy, but above all with immense pride, that the children who leave the stage are welcomed by their families. Tomorrow, it’s time for the intergenerational games organized by the facilitators!